TESS, the Transiting Exoplanet Survey Satellite, is shown in this conceptual illustration obtained by Reuters on March 28, 2018. The search for worlds circling star far beyond our solar system will intensify in the coming weeks with NASA's launch of a spacecraft scientists hope will enlarge the known catalog of so-called exoplanets believed capable of supporting life. 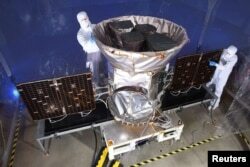 NASA plans to send the Transiting Exoplanet Survey Satellite, or TESS, into orbit from the Kennedy Space Center in Florida aboard a SpaceX Falcon 9 rocket set for blast-off on April 16 on a two-year, $337-million mission. The latest NASA astrophysics endeavor is designed to build on the work of its predecessor, the Kepler space telescope, which discovered the bulk of some 3,500 exoplanets documented during the past 20 years, revolutionizing one of the newest fields in space science. NASA expects TESS to detect thousands more previously unknown worlds, perhaps hundreds of them Earth-sized or “super-Earth”-sized — no larger than twice as big as our home planet. NASA plans to send TESS into orbit from the Kennedy Space Center in Florida aboard a SpaceX Falcon 9 rocket set for blastoff sometime between April 16 and June on a two-year mission. Such worlds are believed to stand the greatest chance of having rocky surfaces or oceans, and are thus considered the most promising candidates for the evolution of life, as opposed to gas giants similar to Jupiter or Neptune. Astronomers said they hope to end up with about 100 more rocky exoplanets for further study. The new probe will take about 60 days to attain its highly elliptical, first-of-a-kind orbit that will loop TESS between Earth and the moon every two and a half weeks. Kepler’s positioning system broke down in 2013 about four years after its launch, and though scientists found a way to keep it operational it has nearly run out of fuel. "So it’s perfect timing that we'll be launching TESS to continue the great activity of looking for planets around stars other than our sun and thinking about what it might mean for life in the universe,” Paul Hertz, NASA’s director of astrophysics, told reporters at a news briefing in Washington on Wednesday. TESS, roughly the size of a refrigerator with solar-panel wings, is equipped with four special cameras to survey 200,000 stars that are relatively near the sun and thus among the brightest in the sky, seeking out those with planets of their own. But unlike Kepler, which fixed its glare on stars within a tiny fraction of the sky, TESS will scan the majority of the heavens for shorter periods and focus much of its attention on stars called red dwarfs, which are smaller, cooler and longer-lived than our sun. One reason is red dwarfs have a high propensity for Earth-sized, presumably rocky planets, making them potentially fertile ground for closer examination, said David Latham, TESS science director for the Harvard-Smithsonian Center for Astrophysics. Also because red dwarfs are so small, and their planets orbit more closely than the Earth does to the sun, the dip in light from a planetary transit of a red dwarf is more pronounced compared with a larger star, Latham said. “It's easier to find interesting planets around smaller stars,” he said. Measuring dips in starlight can determine the exoplanet’s size and orbital path. Further observations from ground telescopes can supply its mass and ultimately the planet's density and composition — whether largely solid, liquid or gas. Martin Still, the TESS program scientist for NASA, said more than 50 rocky, Earth- or super-Earth-sized planets have previously been identified, and NASA expects to increase that number through the new mission. The most favorable discoveries will undergo closer scrutiny by a new generation of larger, more powerful telescopes now under development that will search for telltale signs of water and “the kinds of gases in their atmospheres that on Earth are an indication of life,” Hertz said. "TESS itself will not be able to find life beyond Earth, but TESS will help us figure out where to point our larger telescopes," he said.